Apartment 100 m from El Tarter ski station. Studio Aldo is located in El Tarter, a hill town 1,700 above sea level and just 100 m from El Tarter ski lift, giving direct access to the Grandvalira slopes, in the largest ski resort in the Pyrenees. The apartment is located on the first floor of a new building (2011), there is a lift. Free parking close by. Airy, comfortable apartment, with modern furnishings and in excellent condition. Fully-equipped kitchenette with fridge, microwave, hob, oven, coffee-maker and all the necessary cooking utensils. Washing machine. Sleeps up to four, with two double beds and wardrobes. Full bathroom with shower, tub and hair dryer. Living room with sofa, flat-screen TV and dining table. Horse-riding, golf, ski and hill walking all available locally. Shops, bars and restaurants within easy walking distance. The location gives direct access to the Grandvalira slopes as well as to Soldeu, Pas de la Casa, Grau Roig and El Tarter. Perfect for skiers and nature lovers, with several excellent walking trails nearby. 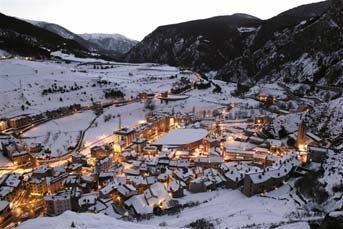 17 km from Andorra la Vella, where you will find shops, bars, restaurants and the Caldea spa.